Growth. – Life Is Such A Sweet Insanity. Every once in a while I will put “All In The Family” on in the background while I’m working. For those not familiar with this ground breaking show, “All In The Family” was a ground-breaking sitcom that debuted in January 1971. The show wove comedy with often heated discussions/fights/explosions on the topics of the times. Over 40 years later, the show is still a television masterpiece. 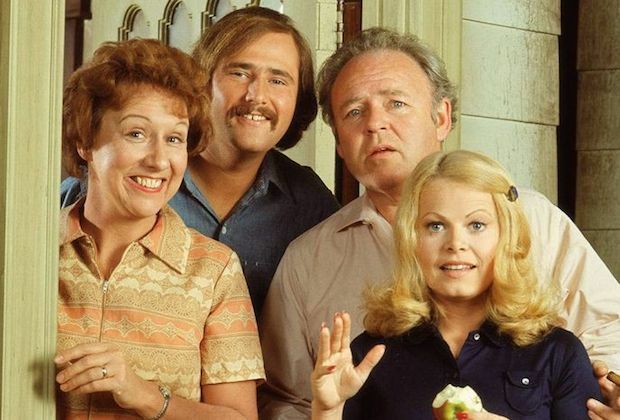 When younger generations look back on “All In The Family”, they’re known to comment on the fashion sense of the early 1970s (what were we thinking), how out of touch Archie Bunker was with the times, Edith’s shrill voice, etc. Some may recoil at some of the language used. There are many elements of the show that are dated but they are vastly outnumbered by the sheer timeliness of the show. Archie and Meathead were fighting about things that Americans fight about today. In the past two days I’ve heard arguments on the show about computers and they way they’re changing society, women’s rights, gay rights, the economy, politics, the environment, religious and bigotry. How disheartening is it that the American society is arguing about these exact same topics? It’s like the citizens of the United States have made absolutely no progress in these hot topics in nearly 50 years! People still call gay folks “fags”, others call minorities by horribly offensive names. Women are relegated to second-place status in our country (God forbid we have a woman president!) and religious nut jobs are still trying to convince us that we should all behave according to their beliefs and everyone else is wrong. I’ve always hoped that during my lifetime I would see encouraging, positive change in our country. Poverty would be dealt with. Folks wouldn’t care about color or race or sexual orientation. Women would be right up there with men. At one time I felt quite encouraged about this, don’t get me wrong, we’ve made some great progress, but there’s a lot of people out there that want to see us go right back to the attitudes of 1971. I’d like to think they just want fodder for another top-notch television show like “All In The Family”, but I doubt that’s the reason. As Americans it’s our responsibility to steer our country in a forward moving direction. We should be electing officials that want everyone to grow, not fostering an atmosphere of holding people back and reintroducing uneducated segregation amongst our people. Luckily, “All In The Family” is still an unbelievably great show that will continue to entertain. Unfortunately, it’s a shame that the topics are still so topical. They don’t want to see us go back to 1971. They want us to go back to 1871.